Nothing bad will happen to you if you park in the Woody, Jessie or other Disneyland lots. You'll find a spot to park, get on big, blue bus and end up at the front gate in no time. That's all fine, but it's also a bit ordinary when you could arrive in style instead. 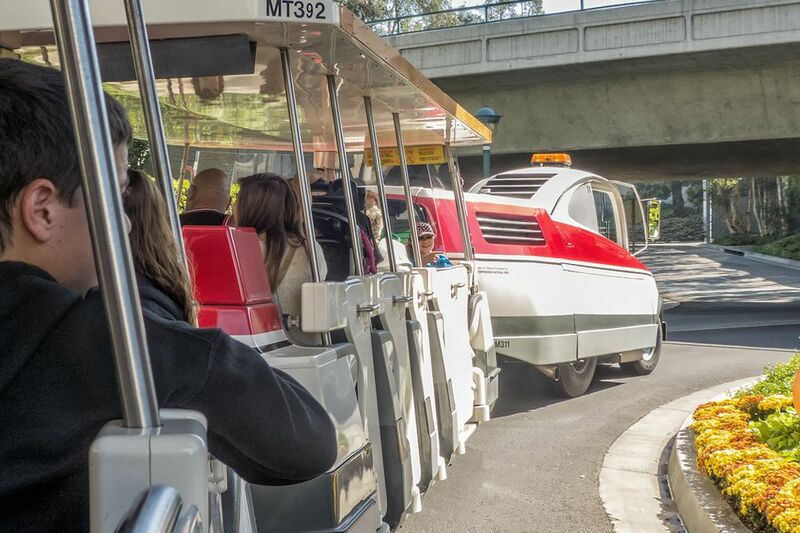 Wouldn't you rather arrive at Disneyland in space-age style on this cool tram? It runs only from the Mickey and Friends parking structure and Toy Story parking lot to Downtown Disney. The cost to park is the same for all lots, and Mickey & Friends has plenty of room (11,000+ spaces), so why not get there the fun way? A few years ago, Disneyland Cast Members accepted expired FASTPASSES at any ride. You could gather them all up and use them later. That's not the case any longer. Each FASTPASS ticket has a time window printed on it. Be sure to get to the FASTPASS line before that window pass expires. Otherwise, all the effort you took to collect it will be wasted. And here's a FASTPASS tip for California Adventure: Even though it has been several years since Cars Land opened, Radiator Springs Racers is still insanely popular. When you enter California Adventure, go straight to the FASTPASS machine for Radiator Springs and get your passes before they're all gone. Some of the rides at Disneyland have minimum height requirements. Some kids want to ride before they're tall enough. Even worse, some well-meaning adults encourage them. They try to figure out what to do to make their kids seem just a little taller than they are. I've even heard of local doctors being asked to document the child's height if it's borderline. In fact, those height limits are for safety, and you shouldn't be trying to get around them. Smaller people who sneak onto a ride before they're ready might fall out of the restraints and be injured. You can find the rides with height restrictions listed in the Disneyland Ride Guide and the California Adventure Ride Guide. The long lines at Disneyland are the least engaging part of any visit. The best way to avoid them is to go during periods of low attendance, but that's not always possible. If you must visit during the park's busiest times, you have lots of options besides just standing in those long lines, sweating but hopefully not swearing. Get 10 Tips for Losing the Wait at Disneyland. It's happened too many times. I ask my friends who just went to Disneyland whether they stayed for the super-fun fireworks and parade, and they say no. They were just too worn out to stay that late. What a shame. You'll know better, though. In the middle of the day, go back to your hotel for a nap. Or a swim. Or just a little quiet time. Go back later in the day and you'll have the energy to stay late. Disneyland's character hosts are some of the park's unsung heroes. Their job is to make sure the characters are safe and that they don't stay longer in the park than guidelines allow. They also have to close lines when it's time for the character to go backstage. I've seen people get upset about that and sometimes they're rude or even abusive with the poor host, who is just trying to do their job. Instead of being a jerk, be nice to the character host. Former hosts have told me that exceptionally pleasant people can sometimes get a little extra attention because of it. These are all the Fun Ways You Can Meet, Greet and Eat with the Disneyland Characters. I keep track of how far I walk every time I go to Disneyland. It averages about a mile for every hour I'm in the park and sometimes more. If you're going to be there from 8 a.m. to midnight, you could walk as much as 15 miles. You probably wouldn't go out your front door for a long walk like that wearing a brand new pair of shoes or high heels, but I see people limping around Disneyland all the time who did just that. I know some of you out there value looking cute above everything else, and you'll do it anyway. If you do, be sure to take along some Band-Aid Friction Blister Block Stick. You're going to need it. And you should probably also know that you can get bandaids at the First Aid centers in Disneyland and California Adventure. This little cutie can wear her princess dress anytime, but older folks can't. Disneyland's guidelines: guests age 14 or older can't wear costumes in the park. Disneyland can - and sometimes does - refuse entry if you dress up looking too much like an official park character. You can dress up in clothing that's inspired by your favorite character, but don't take it to far. I've seen more people than you can imagine arguing with Disneyland security that they should be able to take THEIR selfie sticks into Disneyland, but they never win. In fact, selfie sticks are on the list of prohibited items at the Disneyland website. Along with drones, remote-controlled toys, folding chairs, large tripods and quite a few other things. The ban is a safety issue. The policy was added after a guest pulled out a selfie stick mid-ride on the California Screamin' roller coaster (which is now called the Incredicoaster), triggering an emergency safety stop to keep them from being injured.